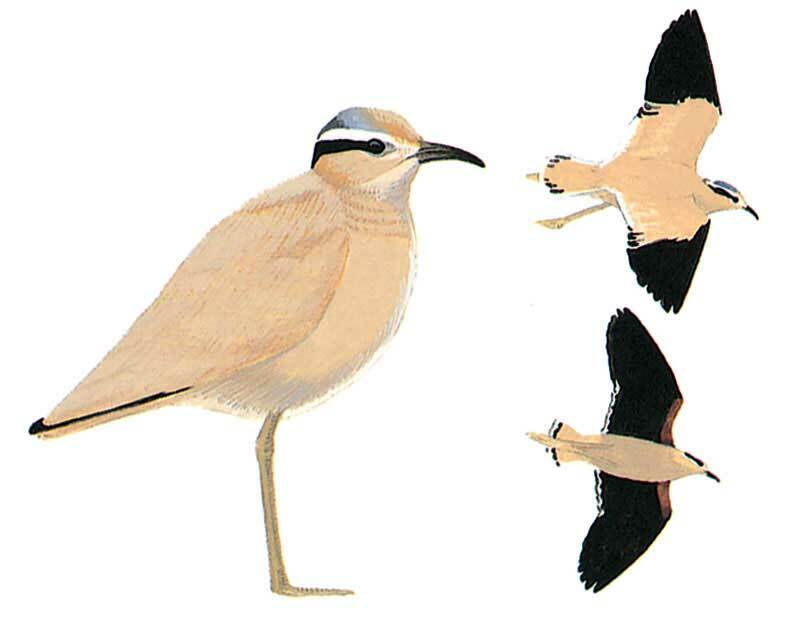 Adapted to desert habitat, well camouflaged; runs quickly with plover-like behaviour and sudden stops, prefers running away rather than flying. Mainly sandy buff with distinctive black and white head markings joining in ‘V’ on nape, bill short and down-curved. When standing has an erect posture with long pale legs. Flight rapid with long, slightly rounded wings and short tail, legs protrude well beyond tail. Wing pattern very distinctive, black outerwing above, and black underwing contrast sharply with rest of plumage. Juvenile lacks grey and black on crown; upperparts, head and breast have faint brown spots or irregular dark subterminal lines, and primaries are fringed buff.